New & Used Aluminum Platform Trucks | ACE Industrial Equipment, Inc. The rugged aluminum platform trucks from Ace stand up to consistent, heavy use. This model uses two swivel casters to make moving through tight spots a breeze. The tread plate decking keeps a tight grip on the load to ensure there are no falls. The push handle makes for easy, stress-free handling. Using the correct type of workplace truck, such as an aluminum platform truck, can help reduce worker fatigue and injury to make sure your operation runs more efficiently. 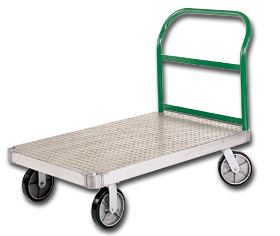 For more information on the different types of new and used aluminum platform trucks we offer, call 1-800-300-6034.